As a matter of fact, I'm pretty sure I have a spare of this assembly for someone in need of it. Kurt, thank you for offering this up. I want to attempt a repair before I look to make a change. The bosses that I have at the moment are painted to match, and I’d like to keep the bike as original as possible. If I crash and burn, I will send you a PM to see what we can work out. Glad to offer it. Like you, I hope you won't need it - the original, painted boss is a beautiful touch on a beautiful bike (and that color is scrumptious). 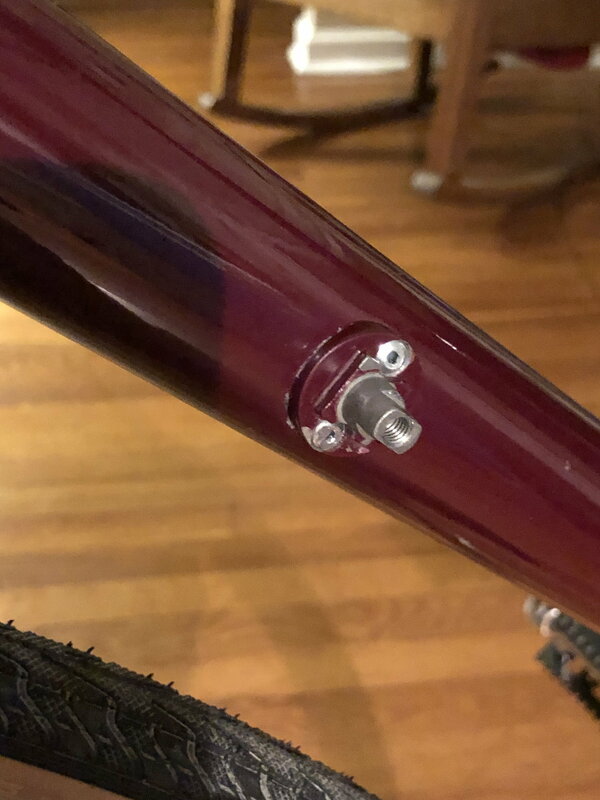 As others have said, take a look on McMaster Carr to see if a small enough pop rivet can be had. Aluminum pop rivet, not steel - you don't want imminent corrosion. I also wholeheartedly back the suggestions of epoxy (though I'd like to know the chemical reasoning why some recommend against JB Weld). Last edited by cudak888; 03-17-19 at 01:29 PM. Clean the area well. Better than you've ever cleaned anything. Get a GOOD two part epoxy that is applicable to aluminum (I would think a marine application would be a good place to start looking). Prep the surface the way the epoxy manufacturer specifies.Epoxy technology has come a long, long way since the bike was originally assembled. Do not use JB Weld! Get good, correct sized aluminum pop rivets, and install them in the existing holes as the epoxy is setting up. Between a GOOD epoxy and the rivets, you should not ever have an issue with them coming off again. The company I work for orders from McMaster car often, so I planned on starting there. I also suspect our maintenance dept has the istallation tool. I don’t want to purchase a tool that I may not use in the future. I will look for better 2 part epoxy as well. I want to do this only one time. Wow, what a beautiful bike!!! I've owned some early Cannondales too. Love the look. By the way, I see you're from Canton OH. So am I! Now in KC. Cool! I don’t see many vintage bicycle enthusiasts in Canton, so I bet we crossed paths at one point or another. Does your user name indicate that you are a pastor? Maybe so. Yes, I pastored in Athens, OH; Uhrichsville, OH and Warren, OH among other cities/states. Now I’m at Nazarene Theological Seminary in Kansas City. I grew up in Canton; I have family there that cycle and collect bikes too. If you really want to do it super right, use 3M 2216 B/A gray epoxy and acid etch first. I maintain that JB Weld however is good enough for this application. Either adhesive will far exceed strength requirements if applied correctly. Note that by JB Weld I mean the long cure stuff, 60 minutes or whatever. The 5 min version is useless. BTW, school was in Niles, Ohio, birthplace of former President McKinley. There is a very nice Western Reserve Greenway rails to trails that goes through Niles, Warren and north to Lake Erie. Plenty of great trails, paved and crushed limestone within reach there. Last edited by mcpastor; 03-17-19 at 04:53 PM. I’m afraid I got us off topic a little. To to get back on, I like this Cannondale. I’m not sure I saw the model, year and component breakdown. Is that in another post? Ohio is always on topic for me, so feel free. When I first started cycling in Canton we did not have many trail options (that I knew of). Fortunately, they have built and expanded a whole lot of trails over the past 10-15 years. I live just a few feet away from the new East to West route that connects the two major north/south routes. It also will tie into the national bike highway! I don’t know if you are familiar with Malone College, but I live within sight of it. i missed the part about the bike. It’s an 83 ST-500 (AA serial number) It’s the first year that Cannondale offered a bike. It’s an eclectic mix of nice parts. Superbe shift levers, superbe tech RD, Cyclone FD, gran compe brakes, SR Apex triple crank, Suntour sealed bottom bracket and Suntour sealed hubs. The bike is surprisingly light when I pick it up. Yes, I’m familiar with Malone. The last place I lived in Canton was with my parents off of Market North of Applegrove. My brother regularly rides the trails there in Canton and vicinity. I’d like to come back and check them out. I did do the TOSRV (Tour of Scioto River Valley) with my sons and him last year. It’s cool you got an AA in ‘83! 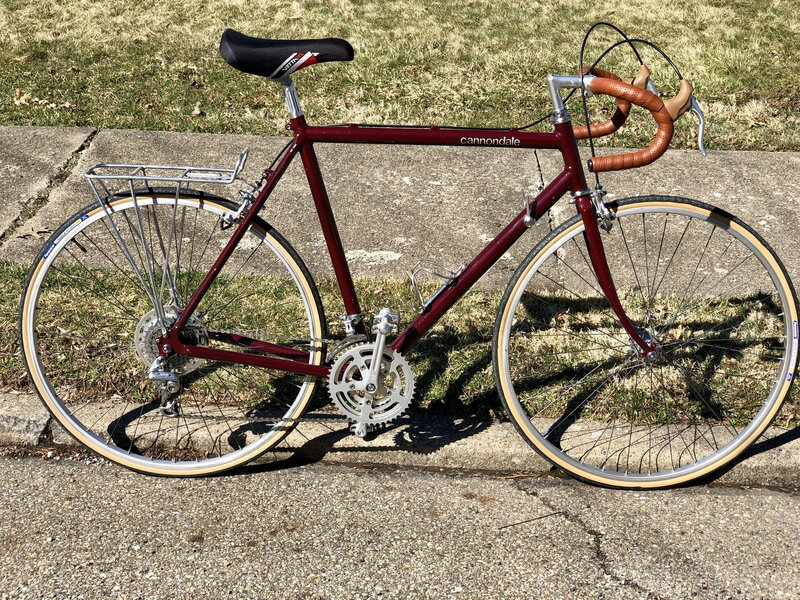 I bought a ‘85 Cannondale brand new for $450 when I was in college in Marion, Indiana. SR-300 model with Suntour Cyclone etc. and loved it. They looked different from anything on the road at the time and felt light and fast. I guess you are going to have the "rocks in the hubcap" syndrome, or did you get them out? No, still in there. I planned on pulling the bottom bracket at some point. I was adding up costs for this project. I figured I was looking at 50 dollars at a minimum by the time I purchased stainless rivets, epoxy, acid etch, rivet tools, etc. I decided to call an LBS that I trust and ask them. It turns out they have done similar repairs. They are going to prep and use a 3m epoxy followed by rivets to hold while it cures. I love that bike shop. They have all the odd parts along with knowledge and appreciation for old bikes. I asked them to check the derailleur tab alignment while they have it too. This story has a happy ending. 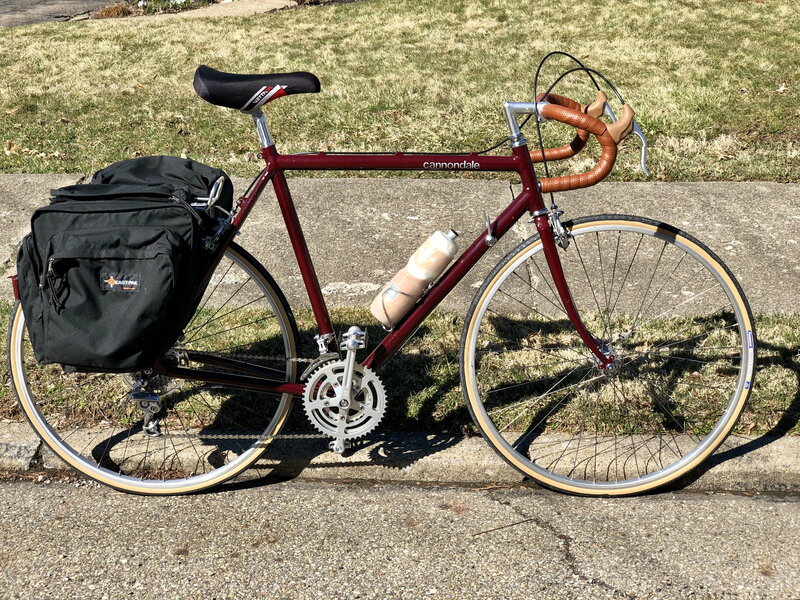 I picked my bike up yesterday and Ernie’s bike shop did a great job on the repair. They used 3M epoxy and rivets. I feel confident that the shift lever won’t be a problem anymore. Today I rode it to work for the first time. I could feel the difference immediately, but after about 5 minutes the bike just felt normal. I have been sick for about a week. I’m looking forward to riding this one with healthy and fresh legs. Sweet bike. Thanks for the update... glad it all worked out for you! Very nice. I have a 1989 ST600 that is a great bike. I switched to 700c rims and Compass Bon Jon Pass 35mm tires. New BB and new headset, the rest serviced, assembled, and tuned. I also switched to Tektro 539 dual pivot nutted calipers and the braking is very good. This one is a keeper. There she is! What a fine looking Cannondale! That is one NICE RIDE !!! Congrats on working out the problems and a successful conclusion. Ride it like you stole it ........and enjoy every minute of it. Thanks everyone. I realized I didn’t post a photo of the actual repair.